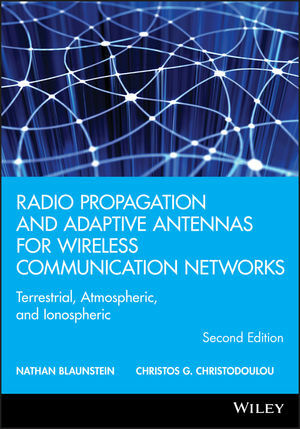 Radio Propagation and Adaptive Antennas for Wireless Communication Networks, 2nd Edition, presents a comprehensive overview of wireless communication system design, including the latest updates to considerations of over-the-terrain, atmospheric, and ionospheric communication channels. New features include the latest experimentally-verified stochastic approach, based on several multi-parametric models; all-new chapters on wireless network fundamentals, advanced technologies, and current and modern multiple access networks; and helpful problem sets at the conclusion of each chapter to enhance clarity. The volume’s emphasis remains on a thorough examination of the role of obstructions on the corresponding propagation phenomena that influence the transmission of radio signals through line-of-sight (LOS) and non-line-of-sight (NLOS) propagation conditions along the radio path between the transmitter and the receiver antennas—and how adaptive antennas, used at the link terminals, can be used to minimize the deleterious effects of such obstructions. With its focus on 3G, 4G, MIMO, and the latest wireless technologies, Radio Propagation and Adaptive Antennas for Wireless Communication Networks represents an invaluable resource to topics critical to the design of contemporary wireless communication systems. Explores novel wireless networks beyond 3G, and advanced 4G technologies, such as MIMO, via propagation phenomena and the fundamentals of adapted antenna usage. Explains how adaptive antennas can improve GoS and QoS for any wireless channel, with specific examples and applications in land, aircraft and satellite communications. Includes the addition of problem sets at the end of chapters describing fundamental aspects of wireless communication and antennas. Nathan Blaunstein is Professor of the Communication Systems Engineering Department at the Ben-Gurion University of the Negev, Beer Sheba, Israel. He is the author of numerous books and book chapters and articles on communication systems, and holds five patents in wireless communications and adaptive antennas, in geophysics and medicine. Christos G. Christodoulou is a Distinguished Professor of the Electrical and Computer Engineering Department at the University of New Mexico, Albuquerque and COSMIAC (Configurable Space Microsystems Innovations & Applications Center) Director. He is also the author of numerous book chapters and articles on communication systems, co-author of 5 books and holds three related patents.